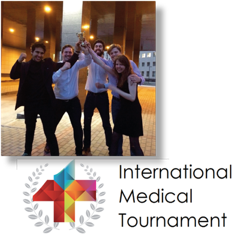 Karl Hillebrandt and his team won this year's International Medical Tournament (English League) in Novosibirsk, Russia! The International Medical Tournament is a team competition for future doctors, which provides unique professional experience such as solving complex diagnostic cases from real clinical practice without any risks, presentation and discussion of solutions among students and experts. The main goal of the competition is to help medical students gather and develop lacking skills for future medical practice, critical thinking in diagnostic process, abilities of teamwork, presentation and rhetorical skills.